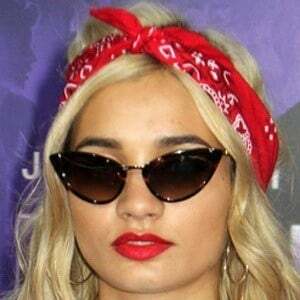 Pop artist who released the hit song "Do It Again" with Chris Brown and Tyga in 2015. She first gained notoriety for her 2011 single "Bubblegum Boy" and in 2013, she covered Drake's "Hold On We're Going Home." She earned a large YouTube and social media following for her covers and original compositions. She has also released covers of "At Last," "The Girl in 14G," and "Fix You." She dated rapper Nic Nac from 2014 until 2016. She was previously in a relationship with Bella Thorne's brother Remy. She has a brother named Peter and sisters named Kandis and Paloma. She collaborated with Bella Thorne on her 2011 breakout single "Bubblegum Boy."